While staying at a home in rural Ireland, a children's author experiences a series of increasingly disturbing hallucinations. Robert Altman was known for tackling multiple genres in his own distinctive style. By 1972 - following two decades working in industrial promos and episodic TV prior to his transition to feature films - he had delivered a space-race drama (Countdown), a psychological thriller (That Cold Day in the Park, arguably his most under-rated film), a war satire (MASH, arguably his most over-rated film), a bonkers surreal comic fantasy (Brewster McCloud), an elegiac western (McCabe & Mrs. Miller) and Images, Altman's one dalliance with the horror genre, restored here in 4K and looking a far cry from the pan and scan presentation this Altman fan discovered it on while browsing late night TV in the '90s. Riffing on Ingmar Bergman's Persona and Roman Polanski's Repulsion, with a smidgen of Herk Harvey's Carnival of Souls thrown in for good measure, Images will likely be compared to the work of David Lynch by anyone discovering Altman's film in the modern era, thanks to its obtuse plotting and doppelganger element. Susannah York won the Best Actress award at that year's Cannes Film Festival for her role as protagonist Cathryn, an author of children's fiction subjected to an increasingly tangible series of schizophrenic hallucinations while residing in a remote country home, her inattentive husband Hugh (René Auberjonois) often away on business. The trouble begins when Cathryn receives a phone call from a woman (voiced by Barbara Baxley) who claims Hugh is engaged in an extra-marital affair. Later, while confronting Hugh, Cathryn is shocked to find her husband morphing into the figure of Rene (Marcel Bozzuffi), her now deceased former French lover. When the couple are joined by painter Marcel (Hugh Millais), with whom Cathryn once had an affair herself, and his young daughter Susannah (Cathryn Harrison), Cathryn finds herself unable to distinguish between her husband and her ex-lovers, living or deceased. As if all this isn't enough to send the poor woman over the edge, she begins to experience visions of her doppelganger, along with her childhood pet dog. If you've been paying attention, you'll notice the trick Altman plays with his film's character monikers, jumbling up the names of his cast to reflect the confused state of Cathryn's suffering subconscious. Reality also intrudes on fiction through Altman integrating 'In Search of Unicorns', a short children's story penned by York, into the film, delivered in voiceover by the troubled protagonist, with a unicorn providing the final piece of the movie's literal jigsaw. Incidentally, young actress Harrison would continue her unicorn-themed burgeoning career a couple of years later in Louis Malle's equally abstract Black Moon. York delivers a powerhouse performance here, outdoing Catherine Deneuve in the earlier, more recognised Polanski film with her portrayal of a woman driven to the edge and in danger of taking someone over with her. She's both this horror film's final girl and its antagonist, and manages to make Cathryn both sympathetic and downright terrifying. There are moments in which Cathryn appears to lock her gaze on the camera, staring through the frame at us, the audience, with a knowing smile, and they're quite unnerving. A year earlier Altman had pulled a little known cinematographer from the world of b-movies to lens McCabe & Mrs. Miller, and with that film Vilmos Zsigmond announced himself as one of the most talented cinematographers of the New American Cinema movement of the '70s. The collaboration continues here with Zsigmond capturing the Irish countryside in a manner that's both beautiful in its capturing of County Wicklow's autumnal amber glow and disconcerting in its isolation, York's house set at the edge of a lake notable for its waters appearing as black as a pint of Guinness. As a director, Altman uses his camera to reflect the disturbed, paranoid psychological state of his anti-heroine. As the camera follows her around the country home and through the local forest, Altman makes effective use of negative space in the frame, creating an unsettling anticipation of who or what might occupy it. Eschewing any kind of post-production or in-camera trickery, Altman manages to pull off the feat of having the real and imaginary characters intermittently swap places purely by clever positioning of his camera and blocking of his actors, resulting in the feeling that when one character walks behind a pillar you're not sure who might emerge from the other side. As you would expect from an Altman film, sound plays a large role here. A set of wind chimes on the front porch of her rural retreat seems to act as an aural trigger for Cathryn's demented mind, tinkling away in the background as other characters innocuously brush against it, unaware of its effect. John Williams delivers one of his most overlooked scores, aided by the avant-garde Japanese musician Stomu Yamashta, who creates discordant, crashing tones and stabs through unconventional means, like hurling rocks into broken down pianos. Though largely acclaimed by critics, if not audiences, on its initial release, history has been cruel to Images, overshadowed as it was by the string of masterpieces Altman would immediately follow it with. But make no mistake, this is one of the director's finest works, and one of the most evocative screen renderings of a twisted psyche. Feature commentary by Samm Deighan and Kat Ellinger, and a scene-select commentary by Altman that runs for about a third of the film; a vintage featurette including interviews with Altman and Zsigmond; a new interview with actress Cathryn Harrison; video essay by Stephen Thrower; original trailer (very of its era; they don't make 'em .like that anymore); and a booklet with new writing on the film by Carmen Gray and an extract from Altman on Altman. 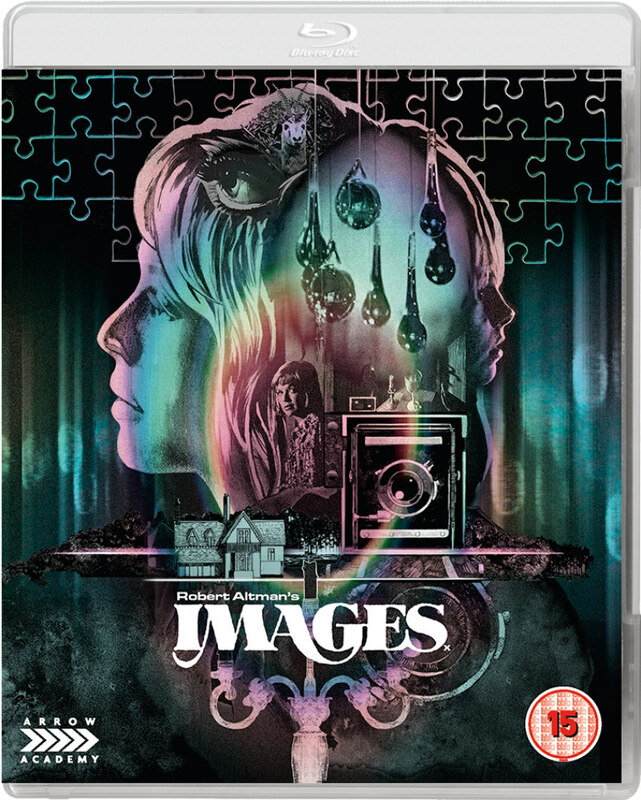 Images is on blu-ray March 19th from Arrow Academy.